Before the white settlers came, and colonized Oregon, the Willamette Valley was first home to a specific Native American ethnic group, known as the Kalapuya, who are also now part of the Grand Ronde Tribes of Oregon. According to the Lane Community College Library (1996) "The Kalapuya were not a single homogeneous tribal entity, but made up of numerous subdivisions, loosely related by dialects. There were three distinctive subdivisions of this tribe which were differentiated by three primary languages: Oregon Penutian, Northern Kalapuyan, Central Kalapuyan, and the Yoncalla. Each of these bands occupied specific areas along the Willamette River and its tributaries". The various Kalapuyan bands were hunter-gatherers, gaining food primarily by fishing. The tribe is known for their use of obsidian, (which was obtained from the volcanic Cascade ranges to the East) to fashion sharp arrowheads and spear tips. The Kalpuyan people were said to number around 15,000 or more. In the early 1800's the tribe had suffered catastrophic losses due to illnesses and circumstances of deprivation brought in by the European colonizers. By 1855 the majority of the tribe was forced to move to the the reservation lands of the Grand Ronde Tribe. By this time roughly only 1,000 tribal members were left, while the settler population in Portland continued to grow at an exponential rate. Mortality rates on the reservation were high due to poor living conditions, and health. By 1900, only 300 tribal members were left. In stark contrast, the Portland settler population by this very same time had already reached 90,426 (RiverViews, Summer 2016). Currently, all that remains of this tribe are highly mixed tribe decendants estimated to be around 4,000. The Kalpuya believed in the existence of a lake and tributary monster known as Amhuluk. According to legend: The monster Amhuluk, whose home is a lake near Forked Mountain had but one passion-to catch and drown all things; and when you look into the lake you see that he has even drowned the sky in it, and has made the trees stand upside down in the water. Wherever he set his feet the ground would soften. As three children were digging roots at the edge of the water he fell on them and impaled two of them on his horns, the eldest only contriving to escape. When this boy reached home his body was full of blotches, and the father suspected how it was, yet he went to the lake at once. The bodies of the children came out of the mud at his feet to meet him, but went down again and emerged later across the water. They led him on in this way until he came to the place where they were drowned. A fog now began to steam up from the water, but through it he could see the little ones lifted on the monster's horns, and hear them cry, "We have changed our bodies." Five times they came up and spoke to him, and five times he raised a dismal cry and begged them to return, but they could not. Next morning he saw them rise through the fog again, and, building a camp, he stayed there and mourned for several days. For five days they showed themselves, but after that they went down and he saw and heard no more of them. Ambuluk had taken the children and they would live with him for ever after. ​According to the City of Portland, Environmental Services (n.d.) The European settlers first arrived in the Willamette Valley in the 1800's. At that time, the region was a pristine, wilderness which was consciously managed and maintained by the Kalapuya peoples. Unlike the Kalapuya, the new settlers were farmers and merchants. In their colonizing process, they began to replace the natural spaces with towns, farms, and roads. 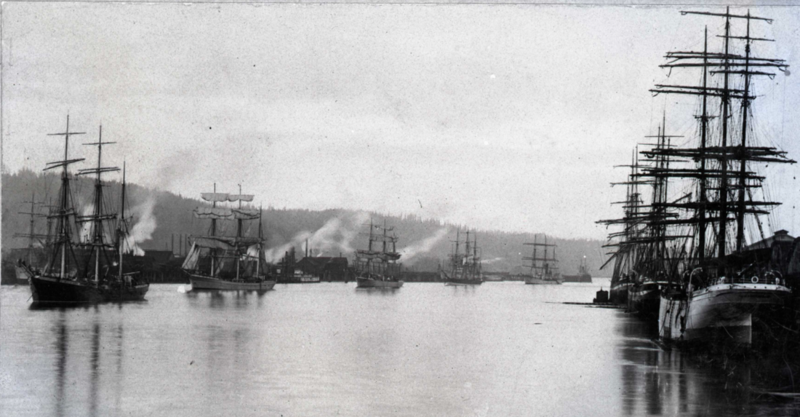 The Willamette River was an integral transportation corridor, and so the early settlers deepened the river channel to make way for paddle-wheeled steam boats. This helped to bring in goods and more settlers in to the valley. Over the years to follow, the Willamette River was further altered for human development purposes. Sloughs and channels were filled, irrigation ditches diverted, and sewage pits created. Since its early existence, the Willamette River goes through a cyclical process of flooding during the wet season. In the past this flooding was rather unremarkable, as the local tribes new these cycles and moved away from the banks during this season. 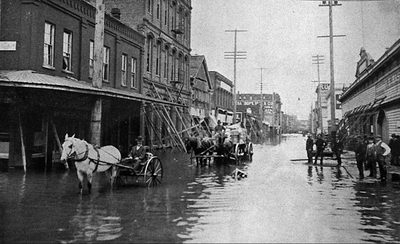 However, with new settlement along the river, the flooding was now able to impact the towns, farms, and industries who were unable to relocate during this time. In the 1940's the Willamette Valley Project emerged as a means to control river flooding, and thus the first dams were built. In the 1950's the what was left of the natural space was almost unrecognizable, and a pollution and sewage crisis arose. 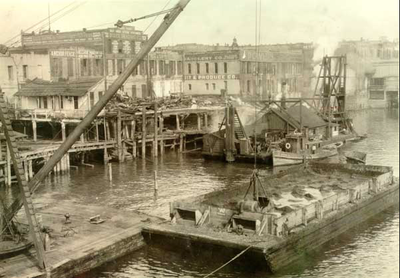 The growing postwar economy brought in large amounts of industrial pollution, and the river suffered greatly. Environmental quality regulation was a new concept during this time. It wasn't until the 1960's with the start of Governor Tom McCall's cleanup campaign, that a concentrated effort in getting the river to a cleaner and healthier state began. In the Willamette River, the floodplain and riparian zone naturally help control flood waters, reduce water temperatures, and provide healthy fish and wildlife habitat. Unfortunately, researchers now estimate that 85% of the entire Willamette's floodplain and riparian zone has been permanently lost due to development and industrial contaminants. One of the largest negative environmental impacts for the Willamette River stems from humans living in its watershed. Restoration and preservation of the Willamette River watershed is absolutely instrumental in brining back the health to our waters. 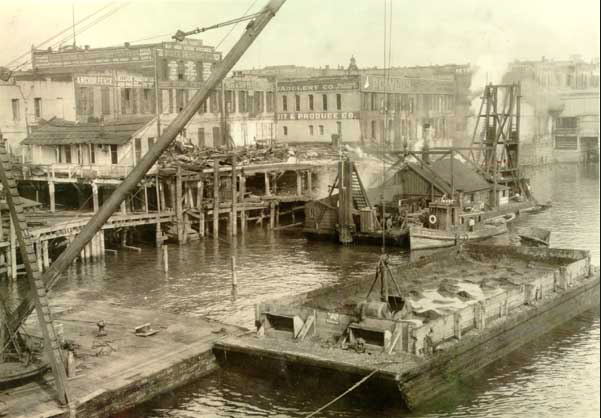 Furthermore, most Portlander's don't realize that several open streams and lakes once existed across downtown, and what is now the NW industrial area. These waters included Tanner Creek, Couch Lake, Guilds Lake, and the Marquam Gulch which is now buried under I-5. The areas were destroyed for the purposes of creating sewer pipelines, and industrial expansion. Additionally, the Portland Waterfront area is now home to extreme disparities among the city elite, and our growing houseless population. Even public view of the river is slowly becoming limited due to high-rise development for the rich, while the poorest of the poor gather to sleep under Portland's bridges. The Waterfront Park Promenade remains one of the few public spaces left specifically intended to protect, and allow public access to the Willamette River waterfront. The Human Access Project has been an integral voice, and hand in helping to promote clean water, and encourage stewardship of Portland's waterways and beaches. Additionally the organization encourages public usage of the rivers, and has helped to create spaces such as Poets Beach as a means for granting public access to the river. The Portlandia Mermaid Parade greatly supports the efforts of the Human Access Project and stands in unity with its cause and mission.